"Well that's creepy as hell." 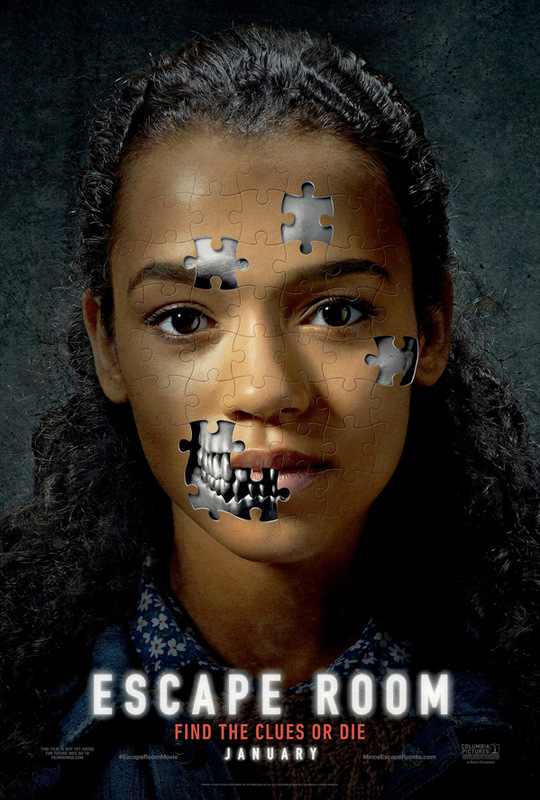 Sony Pictures has debuted the first official trailer for the horror movie Escape Room, which has also gone under the title The Maze, now being released in the first few days of January in early 2019. I'm not surprised that Hollywood has decided to capitalize on the massive popularity of escape rooms by making a horror movie about one. How original. There isn't much of a plot synopsis for this one, but it seems to be a bit like the Saw movies where six strangers end up trapped in some high tech "Escape Room" - though this one isn't just a game, they will really die if they don't escape. The cast includes Taylor Russell, Logan Miller, Deborah Ann Woll, Jay Ellis, Tyler Labine, Nik Dodani, with Yorick van Wageningen. I like that this sends them from room to room, I just hope the whole movie isn't that campy. Everyone is dying to play. Escape Room is a psychological thriller about six strangers who find themselves in circumstances beyond their control and must use their wits to find the clues or die. Escape Room, also under the title The Maze, is directed by American producer / writer / actor / filmmaker Adam Robitel, director of the films The Taking of Deborah Logan and Insidious: The Last Key previously. The screenplay is written by Bragi F. Schut and Maria Melnik; based on a story by Bragi F. Schut. Featuring music by John Carey and Brian Tyler. Sony Pictures will release Robitel's Escape Room in theaters everywhere starting on January 4th, 2019 right at the beginning of the new year. First impression? Anyone think this looks cool?